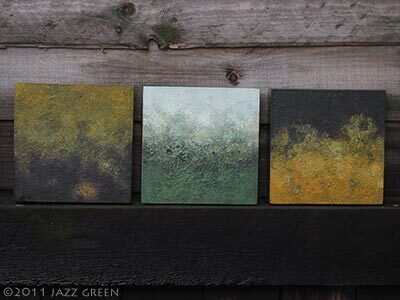 last weekend i delivered twelve paintings to be exhibited in the 2011 HWAT* art exhibition – including my large painting ‘lichenscape‘ (or liken-scape, based on my liking of lichens) which seemed to suit the spot above a dark grey marble fireplace. 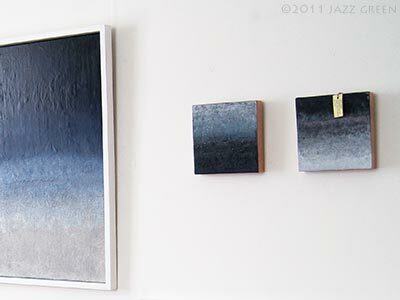 these are different paintings to the ones recently exhibited in six abstract painters at the halesworth gallery. 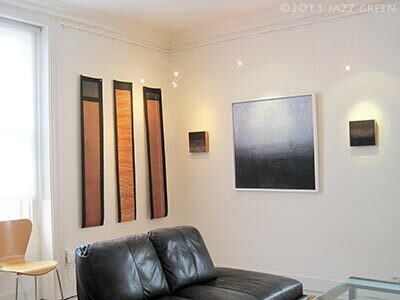 six paintings waiting patiently; edgescape meld/rain (left) and voda (right), and four small edgescape paintings on constructed panels. sometimes it seems like a very long & arduous journey from the beginning of creating paintings to having a cohesive & meaningful exhibition of them. 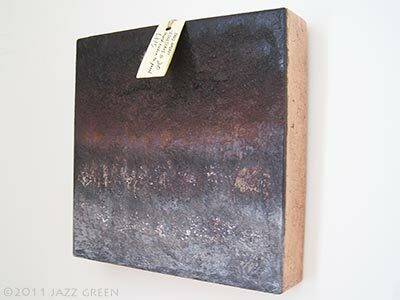 i am very pleased to be showing some of my art as a guest artist along with the environmental artist jane ivimey in HWAT 2011. it’s a creative contrast that works really well as there are some interesting, small similarites in subject matter, colour palette and materials. jane ivimey has spent the last few years in new zealand and is very involved in conservation & environmental issues in her work. this year’s HWAT art exhibition has been expertly curated by caryl challis (the gallery owner) and the artists david page and jane german. i took these pictures of my work in the gallery last weekend when the show was being hung – the tags are left visible to assist placing the corresponding exhibition labels. the harleston gallery is located in a listed georgian building (it’s an old bank building) and it has two very light and spacious exhibition gallery rooms upstairs. on the ground floor there is a more informal café gallery, with a colourful & eclectic mix of art on display, including the popular, ever-changing wall of mini-works (all these artworks are priced under £50). this year the gallery is celebrating its tenth anniversary in business as a venue for contemporary art & crafts, with much of the art in show by professional artists based in the region and some works from further afield. from today (saturday) and for the next three to four weeks the harleston gallery will be hosting the annual HWAT art exhibition, featuring artworks from around thirty local, professional artists. this is the special taster exhibition to coincide with the annual Art Trail or open studios, a starting point from which people can plan their visits to the artists’ individual studios. unlike the county-wide open studios this Art Trail is more selective & intimate in scale – all the artists live/work within a ten mile radius of the gallery and HWAT artists are selected by committee. i bowed out of doing the ‘art trail’ again in 2009 so i feel very honoured to be asked back as a guest artist for this year. yesterday evening was the exclusive preview of the art exhibition – a very lively & convivial social event, with cava & canapés heartily consumed by a chattering, bustling crowd. it really didn’t matter that it was drizzling with rain outside. many of the artists were in attendance along with alot of other people who i had not met or seen before. i was complimented on my work by many people (which was very nice). 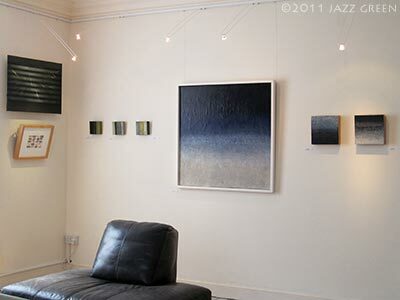 some people said that the room in which my work was exhibited had a very calm, contemplative atmosphere (which was also very nice). i will need to go back to take some more pictures of the HWAT exhibition soon. the exhibition opens today and is open daily until 11th july 2011.
some artists make paintings, exhibit and sell the work within weeks – i am not a fast-track artist; my paintings evolve very slowly & methodically – sometimes i subtly edit them if they are stuck with me for too long – it’s that sense of a history in the surface, forever changing. many people have told me i should be exhibiting my art in london – such an opportunity would be a joyful thing, but it seems london has more than enough contemporary art to deal with (and far too many artists competing for limited exposure). i find it comforting to live & work here in the rural hinterland, but sometimes demoralising not to have as many exhibition opportunities as i would like – rocks, hard places and the places between come to mind. often, i wish i lived in a much larger house with more open & expansive views of the landscape as i think that a sense of being physically restricted, detached or just ‘hemmed-in’ is quite evident in my work. sometimes i see places on my journeys and think it would be quite nice to live there, life would change, one could do this or that – as i suppose we all do. the series of large edgescape paintings on canvas (meld/rain and voda are in this exhibition) were started in early 2008. in late october 2008 they were couriered off to the capital city of london for display in centrepoint tower (a notable, tall office building situated on the corner of oxford street & tottenham court road). 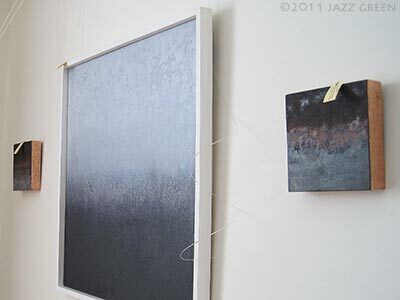 a few days later there was a financial crisis in the city and the paintings returned in early 2009.
in the summer of 2009 i then showed some of the edgescapes in a farm outbuilding (next door to where the painter dee nickerson lives & works). one of the edgescapes, rost (the fiery red painting) was shown in the 2009 HWAT summer exhibition and it was then selected for the elements exhibition in norwich in early 2010. this series of paintings seem to be moving around like transitory, shifting elements or displaced beings – they have come to be what they once just represented – or perhaps they are just my museum pieces. 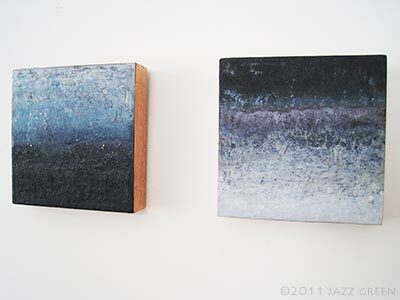 pictured below are two of the smaller edgescapes (which were begun in late 2005 to early 2006). 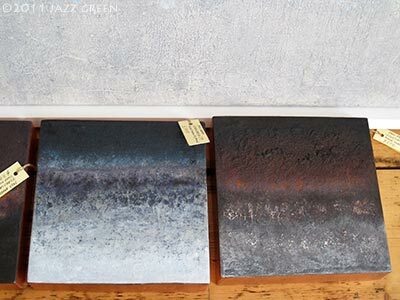 they are called edgescapes to suggest the physical and the metaphysical aspects of the environment, where surfaces, edges, borders or boundaries of things seem to shift, merge or dissolve. each time i say this i express it slightly differently because i am always drawing on what’s currently on my mind. borders and boundaries are a factor in my daily life – such as the flowing course of the river and having to cross the watery boundary it geographically makes, passing from one county to another. i had planned today to go by the river but i have spent the afternoon writing this blog instead. in perception (in drawing, for example) there are no hard, defined edges to things, just changes in colour and tone because things continue around or past the point where you perceive there to be an edge or a line. 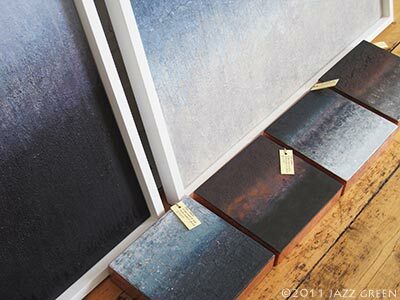 in these works there is an absense of a clearly defined edge or line on the pictorial surface although there is the implication of one forming or in the making, which is contrasted with the physical boundary or hard edge of the panel (i make these panels myself). this area, with its fusion of agricultural fields & pasture with woods, lakes, meadows and marshes, inevitably figures in many of the HWAT artists’ artwork. i find it fascinating how we should depict it or draw upon it as a subject or creative influence so very differently. *HWAT is an acronym of The Harleston & Waveney Art Trail and is, as the artist David Page (a founder member of the HWAT art collective) once pointed out, almost identical in sound and spelling to the first word of the epic poem ‘beowulf‘ – hwæt – which i think approximates in modern terminology to listen up, look here or hear. i have a copy of seamus heaney’s new translation, and on the book’s cover is a painting by barrie cooke, entitled ‘then rain’ – i like this tenuous link as i have a large painting in this exhibition influenced by days of rain. barrie cooke is represented by the kerlin gallery in dublin – i like all of the artists’ work that the kerlin gallery represents. one day i should like to visit ireland (or eire) – i think that the boggy landscape could be quite inspiring. i hope that if you are in the area you will be tempted to view the HWAT exhibition and also visit some of the artist’s studios on the art trail – hwæt HWAT! 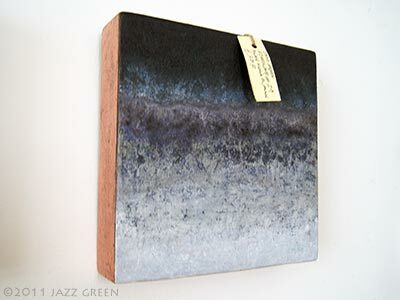 on: Saturday 18 June 2011 by jazzgreen.